Having all my dream neighbors also meant that I could finally get rid of all the house-repelling PWPs in town and build new ones, which quickly earned me a new reputation/rumor. This was quite a shock to see! 😮 It happened after celebrating the second fairytale clock, which was very close to the cliff, so I can only think that Paula was pushed up on the cliff during the celebration when they were all gathered around it. In general, Lyra’s castle area looked beautiful with the cherry blossoms, I thought! I actually don’t really, but I’ve been forcing myself dive more lately for the sake of my museum, and it’s good that the tedious work has paid off a bit! The reason why diving’s frustrating for me 😐 It’s also annoying that whenever you want to take a break or enjoy a calm moment in the water admiring the sky or the view of your town on the horizon, you’re immediately attacked by jellyfish over and over. Another new badge I got! I don’t get too many weeds in Citalune because of BTO, so I think it’s mostly from when Estel did some weed-pulling in my other town when I was trying to collect the flower furniture. I thought it was interesting how the current season was mentioned in Julian’s moving announcement, but I convinced him to stay, of course! First of all, I’ll start by saying that I’ve toyed with the idea of having a ‘sun side’ of town and a ‘moon side’ of town for a long time now (first introducing the concept in this post), but now I’m really trying to solidfy the theme and make it more obvious what I’m going for — hopefully it’s starting to work! I’ve also decided to re-christen Citàlune and its theme as “city of the setting sun and rising moon.” Of course, something like that could never fit in a town name (especially an AC one), but in my head I like to think that at one point it was called “Cittàdel soleilune” or something like that, and then over time it was shortened to Citàlune. Starting off with the main attraction in the sunset part of town, Lyra’s castle 🙂 The exterior is pretty much the same, but I’ve made some new mosaic path tiles depicting a sunset lead up to her house. And there are new, fancier chairs in the two performance hall wings. The new clocks! I really like how the petals seem to be riding a wavy wind in this picture. The entrance fountain has a new sunny garden arrangement around it, and there’s been a new bell built by the gate. 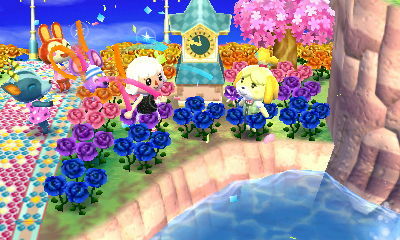 The Re-Tail pond has gotten a makeover, and it’s no longer Reese-and-Cyrus themed with its pink and blue color scheme 😦 I was sad to see that flower arrangement go, but I wanted to make the pond more colorful like the other parts of this side of town. Bunnie’s lighthouse area! It used to only have red, orange, and yellow flowers, but I decided a mix of colors might be nice. The sunset beach has been enhanced with the new stepping stones, a wider variety of flowers, and new shells and gems washed up on its shore. The room with the biggest change in Estel’s castle is the bathhouse, which has been expanded and remodeled. Violet’s magic work-room has changed considerably! I wanted to make it more obviously magical, so I threw in a few magic-in-pop-culture references like cards, a rabbit and a hat, a spinning wheel, etc. But I imagine the objects on the tables are the more serious magic devices, not mere tricks. I wasn’t sure what to do in the right wing, but I knew I wanted something whimsical/magical like the rest of the house, and I do really like the sweets kitchen I ended up going with 😀 It’s also sort of inspired by and made in honor of Melba. The fairy room downstairs, which used to be the location of a vibrant feast, is now a more quiet nighttime forest clearing. The last character house to tour, Fern’s new Tavern! 🙂 Originally I had planned for a cobblestone exterior with a blue roof, but then I decided that the zen exterior & green roof would fit the title “Fern’s Tavern” more, and better coordinate with the windmill next to it. The common room in the tavern, where travelers or guests can gather to eat, drink, and socialize. The rooms for lodging in the tavern, where travelers can spend the night. I was inspired by “The Inn of the Prancing Pony” in the Lord of the Rings for this tavern, which had some rooms for hobbits and some rooms for ‘Big People.’ I put together the basement room with hobbits in mind, with its round windows and cozy beds; hobbits wouldn’t like the bunk beds or sleeping upstairs at all since they don’t like heights. 😛 I’m not saying there are hobbits in Citàlune or anything, it’s just what I was inspired by. xD You could also see the downstairs room as the nicer, more expensive one, and the upstairs room as the cheaper one. Another attraction on this side of town besides character houses is the town tree plaza, which I’ve tried to turn into a flowery forest clearing. I made some new patterns for the flowers, each with a different ‘density’ of flowers, and I like the less tiled/repetitive effect. Hidden away beneath the waterfall, there’s a bench for you to sit and rest. I thought a fairytale one would look nicely here, with the bridge and clocks nearby. And a special garden dedicated to the moon on the lower part of the central river nook. Posted on September 16, 2014 by Amy •	This entry was posted in AC:NL, Citalune and tagged Animal Crossing. Bookmark the permalink. ← It’s time for a WiFi catch-up post! 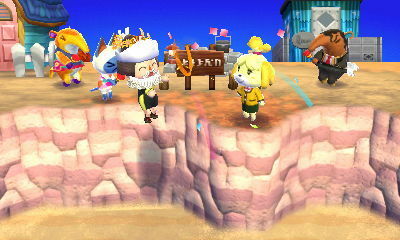 Lol, that Paula standing on a cliff.. those glitches are funny. Yep! I got all my neighbors’ pictures, and also Blanca’s, which I forgot about when I wrote this post 😛 Yep, it was quite a sight ^_^ Tempted to try building another PWP close to the cliff and see if it happens again after the celebration. Aww thank you, glad you think so! 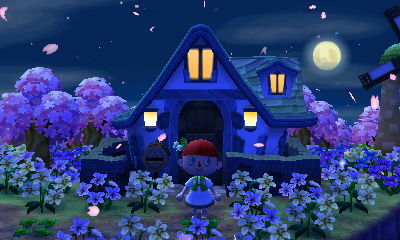 🙂 I wasn’t sure how cherry blossoms would suit my town, but I ended up liking it after all. I’ll be kinda sad to see them go but I guess I better move on soon! Tehe yep, I did some duping of the bamboo grass~ xP I even did a bit of a giveaway on tumblr because I duped more than I needed. Hi, Amy! I was wondering if you had any tips for plot resetting? I finally adopted a dreamie, Rosie ^.^ but I want her to land on a certain spot, and I know how much trouble you had with Pango. Ahh wow that’s wonderful, major congratulations on your golden shovel and your dreamies achieved! I love your town! It’s so pretty!!! Citàlune is. So. Gooorgeous with the cherry blossoms!! It’s really looking amazing now with all of the new and matching PWPs in place, the grand displays of colour and light you’ve designed, as well as the cozy secluded areas hidden here and there. I really like the idea too that it used to be Cittàdel Soleilune that then got shortened, giving the town a sense of history, or it could even still be its ‘official’ name, that people colloquialise as Citàlune. Wow I love the new flower arrangements in the sunset side, and the way the colours radiate out from the fountain. Aww I’m a bit sad to see Reese and Cyrus’ love spot go too, it was a sweet idea xP The new colours leading to Rod’s and Doc’s is irresistible too though x3 And I looove the new mosaic tiles you’ve made, especially the differing colours you’ve used in the sunset one that complement each other so beautifully. It's always fun seeing what you do for Violet's house and looking through all the rooms at the new item combinations 😀 Her work-room would be a great conversation-starter and all her other rooms are scattered with items you don't expect but work very well with the theme. Congrats on getting everyone's villager pic! I didn't know til after the event or at the very end that you could actually say you didn't know who was the real one and they'd give a different hint. Hah what a crazy glitch! The picture you got of Paula enjoying the breeze with her eyes shut, it's perfect! ❤ Was she present at the ceremony or was she already up there at the start? 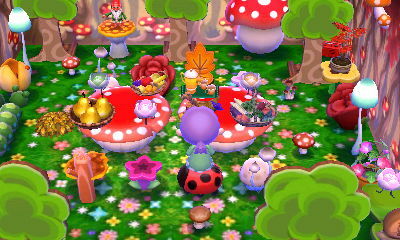 I'm thinking I might bring back the Reese/Cyrus love garden in the winter time, since I like the way it looks with the cool colors of winter better than this new colorful arrangement will likely look with the snow. So it's not gone forever probably, but I miss it a bit too. Currently I'm working on maybe changing the pond garden even more; I'd like to make the arrangement emphasize sunny/sunset colors while coming across kinda dreamy and matching the surrounding areas! Ohh so that’s how the glitch happened. It reminds me of an early screenshot I saw of someone’s completion ceremony where the player was standing in mid-air over the edge of a beach cliff, though that wasn’t quite as spectacular as Paula there.